We are strong buyers of U.S. Silver dollars and 90% silver half dollars, quarters, and dimes. Prior to coming in for a visit, we strongly suggest that you check to see if you have any rare dates (See On-line Guide Below.) This will make it much easier for us to help evaluate your collection in a fair and competitive manner. Belleair Coins is the leading coins dealer in the Tampa Bay area, and one of the most prominent coin dealers in the United States. 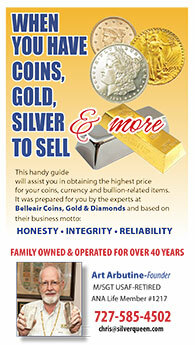 We are coins experts dating back to 1972 when founder Art Arbutine opened the doors to our family business.